U.N. Nuclear Watchdog Says It Will Continue to Push for New Nuclear Power Plants Despite Growing Global Nuclear Concern | Democracy Now! director of Greenpeace International’s Nuclear Campaign. AMY GOODMAN: The disaster at the Fukushima Daiichi plant in Japan has set off a debate in the international community about the future of nuclear power. Demonstrations against the use of nuclear power have drawn thousands in India, in South Korea, in Germany, Japan, Brazil, Taiwan. Governments have taken notice of the renewed safety concerns of nuclear power. There are currently 440 reactors in operation worldwide, generating about 14 percent of global electricity, and plans for new construction have soared in the last decade. India and China, in particular, have set ambitious targets for expanding their nuclear programs. China has plans to construct 70 new nuclear power reactors by 2020. On Monday, the fifth review meeting of the Convention on Nuclear Safety kicked off in Vienna. The U.N. atomic watchdog, the International Atomic Energy Agency, is the primary international body that builds international cooperation around nuclear safety. However, unlike their regulatory role with nuclear proliferation, the IAEA has no authority to enforce safety recommendations when it comes to nuclear power. IAEA Director General Yukiya Amano addressed the opening session, which was scheduled before the crisis. Amano told delegates the worries of millions of people throughout the world must be taken seriously. YUKIYA AMANO: The situation at Fukushima Daiichi remains very serious. The immediate priority is to overcome the crisis and stabilize the reactors. But we must also begin the process of reflection and evaluation. The worries of millions of people throughout the world about whether nuclear energy is safe must be taken seriously. Rigorous adherence to the most robust international safety standards and full transparency, in good times and bad, are vital for restoring and maintaining public confidence in nuclear power. As of the end of 2010, more than 60 IAEA member states had informed the agency that they were considering introducing nuclear power programs. Almost all the 29 countries which already have such programs planned to expand them. In the light of Fukushima Daiichi accident, some countries have announced reviews of their plans for nuclear power. However, the basic drivers behind the interest in nuclear power have not changed as a result of Fukushima. This includes rising global energy demand, as well as concerns about climate change, volatile fossil fuel prices, and energy security. Nuclear power has contributed to expanding the supply of energy. It has also reduced greenhouse gas and other emissions. The IAEA will continue to work closely with both established users and newcomers to ensure that nuclear power is used efficiently, safely and securely, and without proliferation of nuclear weapons. In the light of Fukushima accident, we will redouble our efforts to help newcomer countries to put an effective nuclear safety infrastructures in place well before the first reactor starts up. AMY GOODMAN: That was Yukiya Amano, IAEA director general. That’s the International Atomic Energy Agency. For more, we’re joined by Jan Beránek. He is the head of Greenpeace’s Nuclear Campaign. 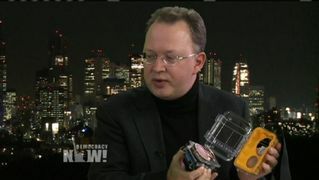 Welcome to Democracy Now!, Jan. Talk about the IAEA and its role in nuclear power around the world. Well, as we may have heard, actually, from the speech of Mr. Amano, the IAEA is now focusing its efforts to restore the public confidence in nuclear power and to help other countries expand the usage of civilian nuclear reactors to generate electricity. And this is actually one of the bottlenecks of the problem, which is that IAEA, the International Atomic Energy Agency, is not, as many people may perceive, an objective body whose first priority is to enforce strong safety standards, but it has a mission, which is encoded in its statutes, which is actually to promote civilian nuclear power and expand nuclear power worldwide. So, in that sense, IAEA actually has a conflict of interest, which we may see happening before, after Chernobyl accident, when again it was saying all the safety standards need to be improved, there is transparency, there are all these conditions in place. But yet, we have seen the Fukushima disaster, and it seems that IAEA is sticking to the old same tune. AMY GOODMAN: Can you talk about the response overall, Jan, to this nuclear disaster that is unfolding in Japan? So, there are examples that some countries try to stick to the business as usual, but some countries are actually already moving away from their original plans. We have seen a big shift in Germany, to give you one example of an industrialized country, where the government basically decided immediately to shut down eight of the oldest reactors. And now we hear the politicians in the government to say that the speed of the phase-out of nuclear power in the country will be faster than before, so by 2020, potentially, they will shut down all the nuclear reactors. AMY GOODMAN: Can you talk more, Jan, about China’s plans for nuclear power, and then your understanding of the — what President Obama is pushing for, a nuclear renaissance in the United States, building plants for the first time here in some 30, 40 years? JAN BERÁNEK: Yes, a lot of China, actually, is pretty exclusive, because if you look at the number of reactors countries have been planning to build in the coming decade, then China is number one. It has been mentioned it basically considers building 70 or 80 new reactors, which is unprecedented growth. And if we talk anywhere in the world about a nuclear renaissance, then actually the place where it may be happening is in China; it’s not Europe, it’s not U.S., because the number of new reactors is limited, and it actually can be zero at the end. So, China, at the moment, is building 27 new reactors simultaneously, which is a massive new build program. But we have also heard from the Chinese authorities that they are going to take very seriously the lessons from Fukushima, and they have basically put an embargo on approval of new reactors. And they are going, definitely, to look into the safety standards and the quality of construction in the reactors that have been already — whose construction already started. So, we actually see a potential big shift in China, as well, which is coming from the fact that, first, the number of reactors is massive, and, of course, if accident like that happens in China, with the high density of population, then the impacts might be very severe, even for such a large economy. And second thing is that most of the reactors China has been building so far are actually the so-called second generation, so they are more or less the same design as Fukushima. The design has been done in the 1970s, 1980s, yet before the Chernobyl disaster, and therefore they do not reflect on the experiences and accidents that have been happening recently. AMY GOODMAN: I want to go back to Philip White in Tokyo, from Jan Beránek, speaking to us from Amsterdam with Greenpeace. Philip, we just talked about radiation of the water, but what about the land, what about the air, and the fact that the Japanese government is now beginning to question the 14 more new nuclear power plants that it had planned to build by 2030? PHILIP WHITE: The initial focus was on the radioactivity released into the air and to the land, and that was probably less than it might have been because a lot of it was blown out — well, it was blown out to sea in the — with the prevailing weather conditions. And what we’ve seen is elevated levels of radiation over a reasonably broad area, but particularly some hot spots that go way outside of the exclusion zone. The exclusion zone has been set at 20 kilometers, and then another further 10 kilometers beyond that where people are supposed to stay indoors. So — but this is far too small a region, and we’ve been calling for a more extensive exclusion zone. And radiation has been — elevated levels of iodine have been found in the water in Tokyo, for example. So I think you’re going to have contamination of food over a quite a substantial area. But now what we’re seeing is this shift to release the radiation into the water, into the sea. And that could be even more severe, in some senses. But I think it’s more — it’s easier for the public to turn off to that. It’s really the fishermen, the fishing people, who are most impacted by that. But when people are actually seeing it in the actual land that they walk on and the milk that they drink and the vegetables that they eat and the water they drink, people are far more sensitive to that. As for the impact of this on the overall program, I think there’s two things to be aware of. One is that that program was never a realistic program. There hasn’t been the demand for an increase in power. And the power companies have had these plans for years and years and years, but each year they set their plans back another year. So, the rate at which power plants have been built in Japan has been much, much slower than the official plans. But these — I think it’s going to — I think it’s almost impossible for any new plants to be built in Japan now. AMY GOODMAN: I want to go last to Jan Beránek. Jan, we just have a few seconds to go, but we talked all about the IAEA, the International Atomic Energy Agency, but what I wanted to ask about was about IRENA, which is the International Forum for Renewable Energy. I think we just lost Jan on the telephone in Amsterdam. Philip White, if you could talk about renewable energy as an alternative to nuclear? AMY GOODMAN: Let me interrupt, because we just have a few more seconds, and we did get Jan Beránek back on the phone. The question of renewable energy — we talked about IAEA, what about IRENA, which is the renewable energy international forum, Jan Beránek? Looks like we just lost him. Well, we’re — Philip White, your last point? PHILIP WHITE: OK. And so, what I was pointing out is that if you listen carefully to Yukiya Amano’s speech, it was all premised on the assumption that there was an ever-increasing demand for energy. And I think it’s just common sense that we cannot have an ever-increasing supply of energy. So, unless you start to look at the physical limits of our planet and think you’re doing things differently, then you’re not going to come up with a solution. What we are pushing for now is to try and convince the people of Japan that there is another way and get through — break through the indoctrination they’ve received over the last 30, 40 years. AMY GOODMAN: I want to thank you, Philip White, for being with us, international liaison officer at the Citizens’ Nuclear Information Center in Tokyo, Japan, and to Jan Beránek, who is the head of Greenpeace’s Nuclear Campaign. He is based in Amsterdam.